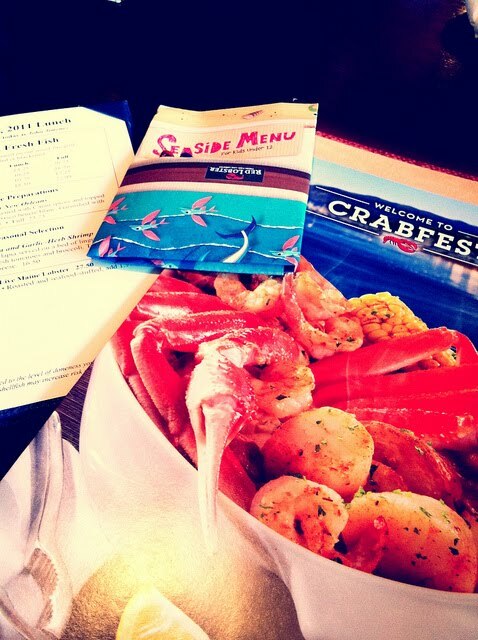 After a morning in the pool, we headed to Red Lobster on Highway 192 (W. Irlo Bronson Memorial Way) for lunch. We got there for about 12ish and it was quiet. I guess us Brits eat lunch early! Shown our table and then introduced to our waiter we began another long perusal of the gigantic menu(s) – the regular one, one with specials, another with fish dishes, and the kids menu for Liam. Since we seem to be having one meal a day with a snack thrown in at some point, we went full out and ordered an appetiser each. Liam had the onion rings ($4.99) which were crispy and he finished the whole bowl! I chose the calamari ($8.99) which also came with deep fried broccoli (which tasted like the seaweed you get in Chinese restaurants) and red pepper. A HUGE portion and I certainly couldn’t finish it without the help of Steve. Steve opted for the clam chowder ($4.25), which was nice, but reminded us of the taste of boil in the bag cod with parsley sauce!! We also received the most delicious herby bread rolls – maybe even corn bread, I can’t remember now. Very moreish! My son decided he wanted to try lobster, and there was a lobster tail on the kids menu which he had. ($8.99) I was most surprised when he ate the whole thing, including the rice which had bits in (herbs etc) and his broccoli (which he loves any way). I too fancied lobster and went for the Seaport Lobster and Shrimp ($22.50) which was on one of their specials menu. A lobster tail, shrimp on a skewer and some more shrimp in butter with fries and a salad on the side. All very yummy! Steve eventually decided to have the Crab and Seafood Bake ($19.99) which had a ton of crab legs, potatoes and corn on the cob. A tutorial from our waiter to show Steve how to crack open the crab legs and he was well away! We ended up sharing a couple of puds – a chocolate cookie cake with ice-cream ($6.25) and an apple crumble a la mode ($5.75). Both delish! We all enjoyed our meal in Red Lobster and would happily go again. Food was hot and tasty and our waiter very friendly and attentive. Our total bill came to $97.42. Three courses (almost) each with drinks at $30ish a head for seafood is pretty good I think. Check out all my Orlando Dining experiences along with my trip reports!